For the first time in its history, the World Meteorological Organization has addressed the UN Security Council on the risks to international peace and security posed by climate change and climate-related disasters. 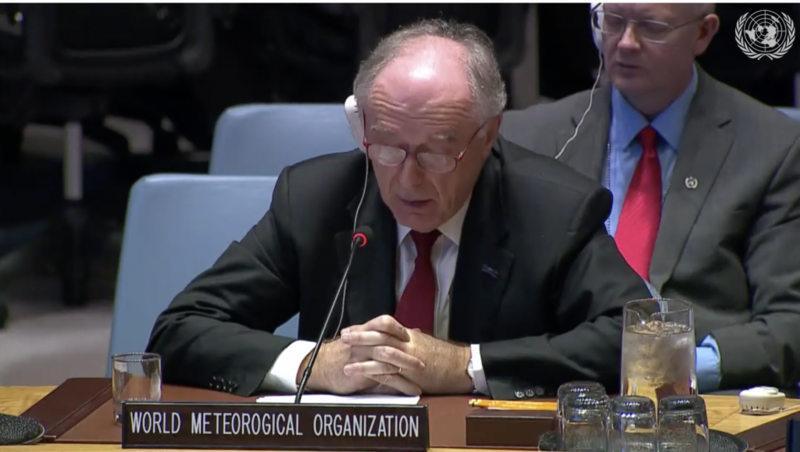 “The World Economic Forum report highlights – yet again – the critical importance of WMO’s core business,” WMO chief scientist and research director, Pavel Kabat told the Security Council. “And early warnings are at the heart of that business. Early warnings to prevent natural hazards becoming disasters. And early warnings about our changing climate, which were issued a full 40 years ago, at the First World Climate Conference, organized by WMO in 1979,” he said. “Climate change has a multitude of security impacts – rolling back the gains in nutrition and access to food; heightening the risk of wildfires and exacerbating air quality challenges; increasing the potential for conflict over water; leading to more internal displacement and migration,” said Mr Kabat in a speech on behalf of WMO Secretary-General Petteri Taalas. It marks the first official briefing by WMO to the UN Security Council on extreme weather and climate issues. It is hoped that this will foster closer collaboration and establish mechanisms for future briefings between Security Council members and the UN system agencies in areas appropriate to the understanding and analysis of peace and security threats. It is almost 12 years since the Council first considered the impact of climate change on peace and security, with pressure mounting particularly in recent years for more substantive action. The Dominican Republic has indicated that it will be one of the priorities of its presidency. Like many Caribbean nations it is vulnerable to the impacts of rising sea levels and more extreme weather. Foreign minister of the Dominican republic Miquel Vargas chaired the meeting, which will also include the participation of several member states at ministerial level. Other speakers include the Under-Secretary-General and Administrator of the UN Development Programme, Achim Steiner and UN Under-Secretary-General for Political Affairs, Rosemary A. DiCarlo. Concentrations of carbon dioxide and other heat-trapping gases reached 405.5 parts per million (ppm) in 2017 and continued to rise in 2018, he said. New research published by the UK’s Met Office states that, with emissions already at a record high, the build-up of carbon-dioxide in the atmosphere will be larger in 2019 than last year due to a slower removal by natural carbon sinks. During 2019 Met Office climate scientists expect to see one of the largest rises in atmospheric carbon-dioxide concentration in 62 years of measurements, it said. The Met Office CO₂ forecast is based on a combination of factors including rising anthropogenic emissions and a relative reduction in the uptake of carbon-dioxide by ecosystems due to tropical climate variability. The last time the Earth experienced a comparable concentration of CO2 was 3-5 million years ago, when the temperature was 2-3°C warmer and sea level was 10-20 meters higher than now. WMO’s provisional Statement on the State of the Climate in 2018 showed that the past four years have been the warmest on record, with many high impact weather events which bear the hallmarks of climate change. The 20 warmest years on record have been in the past 22 years. The global average temperature is nearly 1°C above the pre-industrial era. 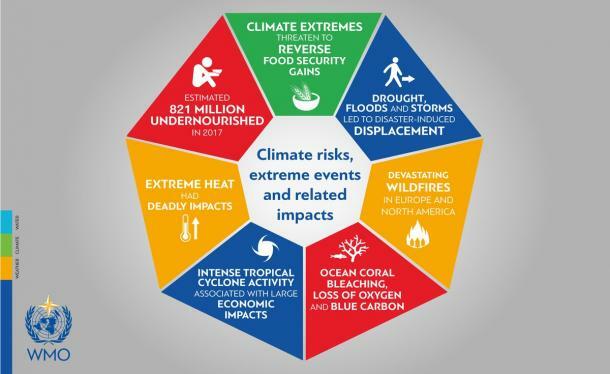 The Special Report on 1.5°C of global warming by the Intergovernmental Panel on Climate Change, which is co-sponsored by WMO, showed very clearly the threats from a 2°C increase in global temperatures, as opposed to a 1.5°C increase. Research by WMO and its partners and network of scientists shows that sea level rise is accelerating, as is the melting of polar ice sheets, posing an increasing existential threat to small island developing states. The shrinking of Arctic sea ice affects not just the local environment and indigenous peoples, but also influences weather patterns in the world’s populated regions. Glacier melt continues unchecked, with short-term impacts including increased flooding and a long-term threat to water supplies for many millions of people. Ocean heat content is also at record levels, with far reaching, lasting consequences for marine life, coral reefs and food security. “WMO is stepping up its support to the UN Operations and Crisis center through a dedicated advisor at UNHQ to provide expert information and to assist UN leadership to make informed strategic decisions. This is vital given that extreme weather and climate, such as floods, drought and tropical cyclones are undercutting progress in the sustainable development goals as we repeatedly see with tragic consequences,” Mr Kabat told the Security Council. “WMO is committed to providing cutting-edge science to the UN Secretary General’s Climate Summit in September and to supporting Member States in evidence-based climate action. In order to meet the challenges and promote the international agenda, there is a need for a new political and investment paradigm to build a new generation of hydro-climate forecasting and early warning services. These are an essential component of basic country-Infrastructure, comparable to roads and bridges,” he said.